Comments Off on Wax On, Wax Off-35 Years and Beyond! As the film The Karate Kid reaches its 35th Anniversary it is being celebrated in some wonderful ways. If you’re lucky enough you may have been able to catch it in theaters again on March 31st (which has passed) or April 2nd if you’re reading this before than. Even if did miss the chance to see the Fathom Events 35th Anniversary Showing, just knowing the film returned to theaters for a short time is a big thing to appreciate, especially for the biggest of fans. 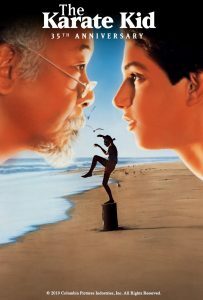 If you are a true fan of The Karate Kid, a true fan, you are aware that John Avildsen & Robert Mark Kamen did not create a simple tale revealing a young man learning karate and winning a tournament. There are layers to the story, layers going deep into the past of the characters, the emotional turmoil of their experiences, going way beyond “wax on, wax off” and into the deep complex meaning of man, soul, and love. That didn’t stop Quirk Books from adding a Children’s adaptation to their POP Classics! line all wonderfully illustrated by Kim Smith and we should all be very thankful of that. Rebecca Gyllenhaal, assistant editor at Quirk stripped down the story turning it into a perfectly suitable story for kids and adults alike. While gone are the anger of Kreese, the love feud between Daniel and Johnny over Ali, the severe injury to Daniel-San’s leg, Mr Miyagi’s unusual past, or the real reasons Daniel and his mother moved to California to begin with, left is a fun and adorable tale of a young man learning karate to overcome bullies and feel better about himself. All with the always awesome art Kim provides. The excellent Quirk book and return to theaters isn’t the only thing to celebrate in terms of Karate Kid 2 though as the second season of the absolutely excellent COBRAI KAI series comes to Youtube on April 24th. While Cobrai Kai is even more “adult” than the original films and a far departure from Quirk’s book, it had a first season that was everything I think Barney Stinson would appreciate. Johnny is the Karate Kid, Daniel-San is the bad guy, but as it was never that simple in the first film, things are not that simple in Cobra Kai. The set up for season two with Kreese’s return, Daniel focusing his energy on a dojo and the inner family conflicts between the LaRusso and Lawrence families building is so quality it really is not miss viewing. 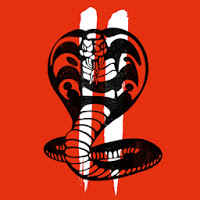 So on April 2nd if you were able to see The Karate Kid in theaters, then on April 24 watch Cobra Kai on Youtube Red (and if you haven’t yet, binge season one as well). 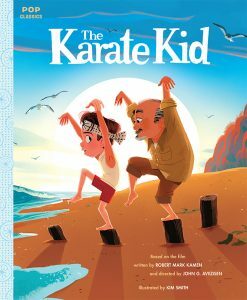 Then on May 7th get your hands on Quirk Books’ The Karate Kid Pop Classic and fall in love with the first film in a brand new way.